Media 19 is a new platform, published with Lodel, dedicated to the study of the media culture, designed and administered by Guillaume Pinson, a professor in the Department of literature at Laval University (Québec), in collaboration with Marie-Ève Thérenty, professor and researcher at the RIRRA 21, University Paul-Valéry (Montpellier 3). 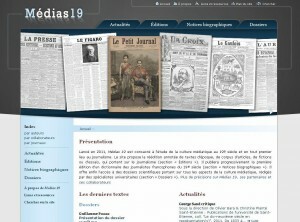 This site ergonomic and pleasant design allows you to be informed of the issues to come, or from the lead on the Nineteenth century and presents the editions in preparation. It is especially necessary to note the publication of thematic dossiers the rich and the fed articles in full text version. The first dossier prepared by Guillaume Pinson entitled “The letter and the press : poetics of the intimate and media culture,” and includes no less than 27 articles. The second folder in preparation for ” the Press and the stage to the XIXe century “, coordinated by Olivier Bara and Marie-Eve Thérenty, and will be constituted by the proceedings of a symposium of the same name which was held from 17 to 19 June 2010 in Montpellier. Previous Article Equality between men and women : can do better !